Ukraine civilian casualties surge Jump to media player The latest surge in violence in Ukraine has been "catastrophic" according to the United Nations. Civilian deaths in Ukraine battle Jump to media player At least 16 civilians have been killed in intense fighting for the key town of Debaltseve, in eastern Ukraine. 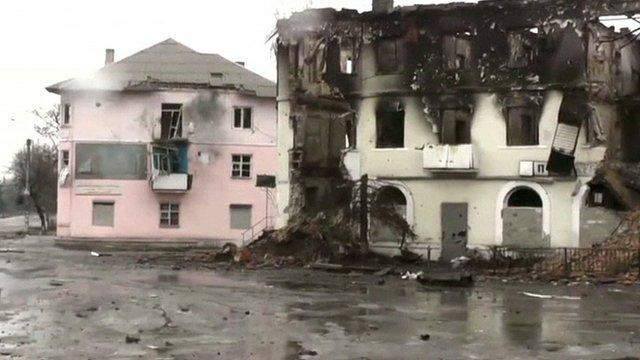 Fighting continues around Debaltseve Jump to media player There has been fierce fighting around the strategic rail hub of Debaltseve in eastern Ukraine. Fleeing the shelling in eastern Ukraine Jump to media player Peace talks aimed at ending the violence in Ukraine have ended in Belarus without a deal after just a few hours. Ukraine town targeted by rebels Jump to media player Government troops in the town of Debaltseve in eastern Ukraine have been almost fully encircled by pro-Russian soldiers. Ukraine hospitals 'under attack' Jump to media player The BBC's Sarah Rainsford meets Andreas Koutepas, the local Medecins Sans Frontieres co-ordinator in Artemivsk, eastern Ukraine, who says that hospitals in the region have come under attack. Ukraine civilians 'caught in firing line' Jump to media player Nato has dismissed as "nonsense" claims by Vladimir Putin that Nato soldiers are fighting alongside Ukrainian government troops in Eastern Ukraine. The latest surge in violence in Ukraine has been "catastrophic" according to the United Nations. The number of civilian casualties in the conflict has risen sharply, as pro-Russian rebels have launched a new offensive. The UN says more than 5,500 people have been killed since the fighting began in April 2014.